Mole•Master offers tube/head testing and recertification, not only for Safe-T-Shot products but for any similar products your facility owns and uses. This testing can be performed at your site with our new portable testing trailer or in our lab at our International Headquarters. 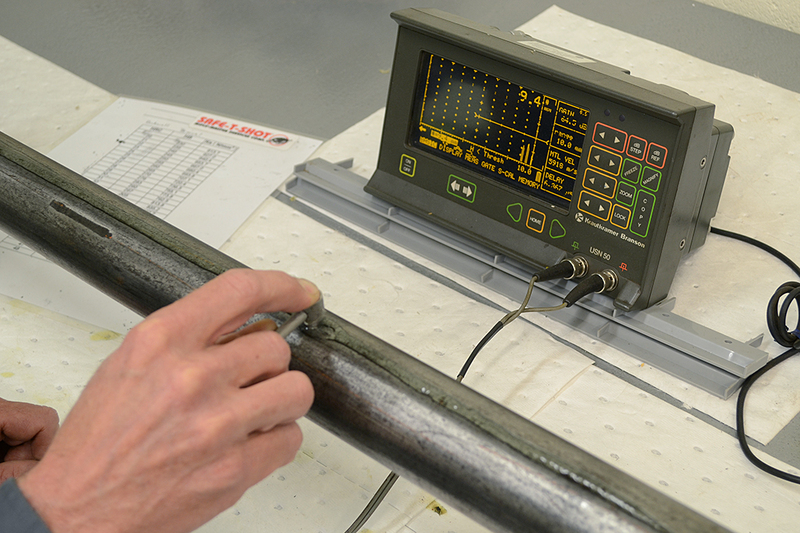 Thickness is measured with a krautkramer ultrasound thickness testing system. Tube strength or hardness is measured using a Brinnel hardness unit and are taken in HRC and HB scales. For both tests the tubes are tested carefully in three different spots for optimum accuracy, more if the measurements are borderline. If the actual wall is smaller than normal, the tube is rejected. If the actual wall is equal to or .5 greater than normal, the tube is released for one year. Between .51 and 1.2 > NOM equates to a release of two years, and 1>NOM yields a release of three years. Thread gauges are used to determine the wear of all threaded areas. Not until a tube or head passes all of these tests will it receive recertification. Records of each test are kept to compare each time they are re-tested.